The Oneonta Gorge is a scenic gorge located in the Columbia River Gorge area of the American state of Oregon. The U.S. Forest Service has designated it as a botanical area because of the unique aquatic and woodland plants that grow there. Exposed walls of 25-million-year-old (Miocene epoch) basalt are home to a wide variety of ferns, mosses, hepatics and lichens, many of which grow only in the Columbia River Gorge. Oneonta Gorge has been described as "one of the true dramatic chasms in the state." There are four major waterfalls on the Oneonta Creek as it runs through the gorge. Middle Oneonta Falls can be seen clearly from a footpath and is very often mistaken for the upper or lower falls. The lower gorge has been preserved as a natural habitat, so there is no boardwalk or footpath through it as such. Thus, Lower Oneonta Falls can only be seen by walking upstream from the creek's outlet at the Historic Columbia River Highway. To get to a vantage point where the entire lower falls is visible can require wading through water that in some places can be chest-deep, depending on the season and the relative amount of snow-melt. The upper falls are about 1 mile upstream from the middle falls and require scrambling up the creek or climbing down a canyon wall to view. The fourth falls which is "Triple falls" can be seen from a vantage point on the upper trails in the canyon. The trail has some issues due to some natural as well as human impacts. In the late 1990s, the stream was partially occluded when three large boulders tumbled into the stream. Subsequently, a log jam has formed along the trail. This has created a hazard for hikers, which led to a fatality in 2011. 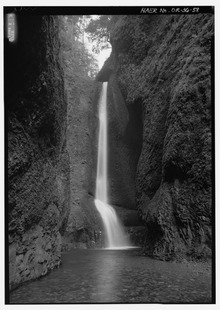 The Oneonta Gorge was first photographed by Carleton Eugene Watkins, a native of Oneonta, New York, who had traveled west during the time of California Gold Rush of 1849. Watkins named the Oneonta Falls after his hometown. ^ a b Friedman, Ralph (1990). In Search of Western Oregon. Caldwell, Idaho: The Caxton Printers. p. 313. ISBN 0-87004-332-3. ^ "Slideshow: Oneonta Gorge". NW Life. Oregon Public Broadcast. Aug 9, 2012. ^ "Hiker dies after 'freak accident' in Gorge". KGW Staff, KGW.com. May 19, 2011. ^ "Oneonta/USA". Greater Oneonta Historical Society. Retrieved 2009-06-20. This page was last edited on 2 September 2017, at 09:06 (UTC).